Sodium Sulfacetamide (Sulfacetamide) and Sulfur dual treatment prescription medications were discontinued by manufacturers during the end of 2012/beginning of 2013. Sulfacetamide/Sulfur prescription topicals comprised of creams, lotions, gels, cleansers and treatment masks have been used since the 1960’s to treat acne rosacea, seborrheic dermatitis and acne vulgaris. Although highly effective for many patients, the combination of these two products were never FDA-approved as prescription treatments for these three inflammatory skin disorders because extensive clinical testing was never performed. The safety is generally excellent and the side effects few so these treatments were “Grandfathered” in as generally regarded as safe (GRAS) until recently when the FDA informed all manufacturers and pharmaceutical companies that they could not make any medical claims and required them to include the statement “THIS DRUG HAS NOT BEEN FOUND BY FDA TO BE SAFE AND EFFECTIVE, AND THIS LABELING HAS NOT BEEN APPROVED BY FDA.” These changes made all manufacturers weigh the risk of liability and without the ability to make prescription-based medical claims would greatly affect sales of every sulfacetamide/sulfur combination medication. Before these FDA-mandated changes were initiated there were at least 16 companies making dozens of sulfacetamide/sulfur prescription treatments for acne rosacea, seborrheic dermatitis and acne vulgaris. As of this date almost all companies/pharmaceuticals have discontinued their entire prescription treatment lines(USA). For further information about unapproved drugs, click here. Sodium Sulfacetamide is a topical antibiotic that also has moderate anti-inflammatory actions. It reduces skin inflammation by killing bacteria and by suppressing inflammatory immune cells that build up in rosacea skin. Ten percent is the most effective dose for the treatment of inflammatory skin disorders. Topical sulfur treats rosacea papules and pustules, clears pores (keratolytic actions), reduces inflammation around the pores and treats demodex. The combination of these two medications acts synergistically on rosacea skin to improve clearance of rosacea symptoms. Why is the Discontinuation of this Treatment so Important to Rosacea Sufferers? Many rosacea sufferers require internal treatment with systemic medication in combination with topical treatment for superficial symptoms; Sodium Sulfacetamide/Sulfur lotions are one of the best topical treatments available for rosacea treatment and over the last decade is the number two selling rosacea prescription showing its popularity and effectiveness. In addition, for more severe cases, patients can use a facial wash in combination with the treatment or a facial treatment mask to shrink pores, fibrosis and swelling. A significant portion of rosacea sufferers also have coexisting seborrheic dermatitis and/or mild-to-moderate acne which makes this treatment ideal as it targets all three inflammatory skin disorders. Without topical Sulfacetamide/Sulfur treatments, many rosacea sufferers may need to use three separate treatments which is likely to irritate hyper-sensitive rosacea skin. This is not good news ! Clarifoam EF may also discontinue production in the near-future, but their small clinical study by Dr. Zoe Draelos detailed below does buy them some good-will with the FDA. “The multifunctionality of 10% sodium sulfacetamide, 5% sulfur emollient foam in the treatment of inflammatory facial dermatoses” J Drugs Dermatol. 2010 Mar;9(3):234-6., Draelos ZD. Prior to 1962, some of the most versatile drugs in dermatology were approved by the U.S. Food and Drug Administration (FDA) solely on the basis of safety.One of these is the combination 10% sodium sulfacetamide and 5% sulfur. Sodium sulfacetamide possesses anti-inflammatory and antibacterial properties while sulfur is a nonspecific antibacterial and antifungal. A new emollient foam formulation of 10% sodium sulfacetamide and 5% sulfur allows a thinner application film and leaves behind no residue on hair bearing or non-hair bearing skin. The sulfur smell is also more quickly dissipated with reduced irritation. This uncontrolled, observational, prospective, open-label, single site, eight-week study enrolled 24 subjects (eight with rosacea, eight with seborrheic dermatitis, eight with acne vulgaris) to evaluate the safety and efficacy of this novel foam formulation.At eight weeks, statistically significant improvement was seen in inflammatory rosacea lesion counts and the signs of seborrheic dermatitis. A 50% reduction was noted in the total acne lesion counts. These findings confirm the versatility of an emollient 10% sodium sulfacetamide and 5% sulfur foam. It’s germane to point out that some pharmacy warehouses may still carry some discontinued treatments in stock because they purchase in bulk. However, once the last treatment is sold to a patient the discontinued products listed above will no longer be available. 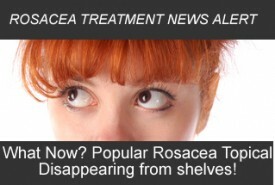 What can you do now that these rosacea topical products are being pulled? While Rosadyn will continue to be here to help manage and treat your rosacea from the inside though its blend of high grade nutracuticals that help to support minimization of facial redness, rosacea triggers and strengthening of your vascular system, many rosacea sufferers with papules and pustuals and advanced stages of rosacea also need external topical treatment to reign in their superficial rosacea symptoms. We all know that treating rosacea is not a one product or one treatment solution but a combination holistic approach of internal support, health, diet, lifestyle and external skin care and treatments to managing rosacea. We know the discontinuation of these topical products (USA) that have helped thousands of Rosacea sufferers is not good news. This is why we are suggesting the following solution to our fellow rosacea sufferers who also may be successfully using these rosacea creams, wash’s and masks and feel they have been left out to dry without any options. If you have used 10% Sodium Sulfacetamide/5% Sulfur Lotion in the past your dermatologist or primary care physician can simply write you a prescription to get filled at a reputable compounding pharmacy. The compounding pharmacy can create a lotion, cream or gel depending on your skin type and sensitivity. Adding anti-redness/anti-irritant ingredients like Japanese Green Tea (2%), Japanese White Tea (2%), Roobois Tea (1%), German Chamomile (2%), and/or Bisabol (0.5%) into the final lotion, cream or gel. All compounding pharmacies have access to these ingredients and they should not add much to the overall price. Lastly, ask them to put the final lotion into an airtight squeezable aluminum tube (not a compounding jar that is open to the air and bacteria from your fingertips) or else the product will oxidize, precipitate out and lose its effectiveness quickly. Please Comment: Have you found another Source for Sulfacetamide/Sulfur Treatments or a Quality Compounding Pharmacy that uses Rosacea-Friendly Bases in their Formulation? Rosadyn thanks you in advance for your input and contribution to the Rosacea Community! Together we can change the face of rosacea! Please share your tips and resources below in our comment box area below. Rosadyn has been working great for me. You cant even tell i have rosacea. I get by with one pill every other day. I have tried Sulfa antibiotics before but had an allergic reaction to it. But im sure they work great for some people. I’m not from the U.S. but it seems to me that this is an example of the frustrations caused by blanket policy making, which can be a difficult balancing act of simplicity to complexity for legislators/regulators anywhere in the world. I am definitely going to have something compounded for my rosacea. Good to know I can specific ingredients added to the compound that will help. All I have ever been given by my dermatologist is steroid creams which made things worse and can thin my skin.